After a thorough examination of the outdoor fryer market, we’ve found that the best outdoor fryer is the Bayou Classic 700-701. It is big, simple, and easy to use, and is extremely versatile. It’s also a breeze to clean, which is always a plus! It’s one of the most well-crafted outdoor fryers currently on the market and suffers from few manufacturer errors. It’s also covered under a 1-year warranty, which is always a plus when with something that uses hot oil. Although the price is a bit high, it’s worth it for the quality. For a full review of the Bayou Classic, see below. In second place comes the Chard Outdoor, which is a fryer primarily used for tailgating, camping, and other situations that could require the transport of cooking equipment. It’s large, roomy enough for multiple baskets, and provides excellent heat control for better cooking. It’s inexpensive considering its utility and size. Really, the two main reasons it doesn’t come in first are that this model doesn’t have a lid, which means oil can splash, and it’s not as versatile as the Bayou Classic. Otherwise, it’s a great option. For more on the Chard Fryer, see below. For those on a budget, you won’t go wrong with the FDW fryer, which is positioned at a great price point but still includes all of the essential components of an outdoor fryer. It’s portable, reliable, and has enough energy to cook a turkey. Compared to many of the other models on this list, the FDW even has a higher energy output than some, making it versatile. While it’s not as complex and well-made as the top two, it will still last and provides enough bang for the buyer’s buck. For further information on the FDW, see the Product Reviews section below. There are a ton of different varieties of outdoor fryers available, with multiple different options and configurations available. Here are a few apsects to keep in mind when shopping for outdoor fryers. Virtually all outdoor fryers run off of propane gas. It’s possible to get converters for most fryers to hook them up to natural gas, should you have an outdoor natural gas hookup in your space, though the vast majority work off of propane. It’s possible that some air fryers are designed to plug in, but virtually all other designs work off of propane. There are a few different formats for fryers. Pot fryers work by using a high-powered propane burner (think a burner on your stove) to boil liquid in a pot. Typically this liquid is some sort of neutral oil like peanut oil, but not always. Foods are then inserted into the pot with either a fryer basket or a rack for a turkey or other large piece of meat. These are also quite useful for making beer, we should add! Basket fryers typically look more like what one might see at a restaurant kitchen than a pot-style fryer. A basket fryer is basically a container of oil that has a basket inside. Food is placed in the basket and fried, and then removed for serving. Basket fryers arguably do a better job of frying than pot fryers, but cannot, for example, cook crawfish in a crawfish boil. Air fryers are a fairly new technology that cooks food using infrared heat and no oil. This is purported to be a healthier way of cooking than standard frying. No oil is used, drastically reducing the fat and grease content of food. And yet foods get crispy and tasty using an air fryer. Those who are health conscious may be quite attracted to the idea of an air fryer, and it’s worth investigating. Also, it’s arguably a good deal safer than other fryers, as there’s no chance you’ll be splattered by oil. Many want to take their fryer with them to tailgating parties, sporting events, concerts, camping, and the like. You should consider how portable your fryer is. Typically pot-style fryers are more portable than basket-style fryers, but not always. Pay attention to what’s included in the package. You’ll almost always need a strainer, a thermometer, a basket (or multiple baskets), perhaps a pot, and a heater with hoses. Depending on the format you choose, you may want different size and configurations for baskets, and a waterproof cover may be a necessity if you plan on leaving the fryer outside for long periods. People love fried food. They worship it. What’s more, they often can’t get enough of it! But what happens when you want to make fried chicken for a garden party, while camping, or during a massive tailgating event? Well, an outdoor fryer can simplify the process and can achieve things that indoor gas burners can’t do. Most outdoor fryers are designed to hold at least a turkey, although sizes may vary. Based on these dimensions, it’s possible to just about make anyone’s favorite fried luxury in the great outdoors. In this section, we’ll look at five awesome outdoor fryers with different designs. We’ll start with a comparison table to get oriented, and then move into individual product reviews. We’ll conclude with a recap of our favorites. Full Product Dimensions: 14 x 18.2 x 14 in. The King Kooker 1265BF3 Portable Propane Outdoor Deep Frying/Boiling Package (King Kooker 1265BF3) is a combination fryer and boiling or general cooking pan designed for outdoor use. King Kooker is a Louisiana brand, so this fryer comes from the right place! It must be connected to a propane tank or other similar energy source for maximum cooking potential, so be sure you have a tank full of gas before you get started. The set is made from aluminum and comes in stylish black and silver. Everything is set on a stable base to make sure there are little to no spills or unnecessary heat loss. This fryer works great for turkey, but less great for crawfish boils. The strainer basket is about 1/2 the size of the pot, which means that the bottom half of the pot will remain empty. You can fit about a 20 lb turkey in the fryer, max. It’s a bit of an awkward design, and if you want a full-sized strainer, you may want to pick a separate one up. There is a timer that needs to be checked and reset every 30 minutes, or else the burner will turn off. This is a safety measure to prevent damage, burning, or fires from unattended food. The timer requires two batteries, which are not included. The entire outdoor fryer consists of five removable pieces: a pot, lid, basket, turkey rack, and a hook to lift and lower food into the pot for frying. The pot is 29 quarts and the pan is 11 quarts. Without food or oil, the set weighs roughly 19 lbs. and has full product dimensions of 14 x 18.2 x 14 in. At its maximum power, the King Kooker fryer should emit 33,000 BTUs which is in the middle of the range of fryer outputs. Like all of the fryers on this, the King Kooker 1265BF3 was made for the outdoors and does come with a limited one-year warranty, which is always a plus. The full set should last for several years. The King Kooker 1265BF3 is a decent outdoor fryer and includes a lot of pieces that people will enjoy, especially if they want to bring a miniature kitchen when they go camping or host outdoor parties and events. Unfortunately, some find issues with this fryer. For one, the battery pack doesn’t tell the user which direction to put the batteries. A minor complaint, but confusing! Perhaps the biggest complaint is the timer. Yes, it’s there for safety, but many find that it is too irritating for regular use, and it’s constantly there. Many others don’t have such a system, so perhaps a setting that would optionally disable this would be helpful. Additionally, there are quite a few build quality issues that come up pretty frequently. Overall, buyers might be better off with another model. Full Product Dimensions: 14 x 14 x 12 in. 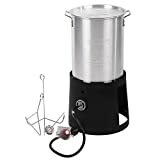 The FDW Portable Propane Cooker with 30-Quart Outdoor Turkey Fryer Kit (FDW) is primarily designed to be a turkey fryer, but can also be used for frying just about anything else outdoors safely. Like most fryers, it relies on an unincluded gas source to supply the power to generate heat. It comes with a large 30-quart pot for cooking, which has full dimensions of 14 x 14 x 12 in. This pot, therefore, has a cooking surface with a 14 in. diameter, which is in enough room to cook most foods, including turkeys, chicken, fish, taco shells, and others. You can fit a maximum 20 lb turkey in this pot, which is pretty similar to the King Kooker above. The FDW fryer comes with a patent-pending design to keep the heat centralized in the pot and prevent uneven cooking. The hose and regulator that connects to the gas source can be adjusted. Users can measure the heat of the oil for frying with the stainless steel 12 in. thermometer that is included as part of the fryer kit. Note that one user commented that the thermometer was not configured correctly, and he burned his food. You may want to check your thermometer compared to another type or use a digital thermometer, just in case. The full set is made from steel and iron, which gives the kit a distinct black and silver design. The FDW fryer set includes a burner, pot, thermometer, rack, and hook. One item that doesn’t come included in the package is a strainer bucket, so you may want to pick one up. Buyers will need to supply their own heat source but can hook up canisters for portability. The heat source can supply 54,000 BTUs, which is a pretty solid power output. The FDW fryer is a decent, affordable product. While it’s not as versatile as other models, it provides all of the basic functions of an outdoor fryer and is roomy enough to cook larger chunks of game or regular food like turkey. It comes with plenty of pieces, has a reliable thermometer, and actually supplies more heat and energy than many other models. For these reasons, it’s this review’s budget pick since it’s small, affordable, and reliable enough for at least a year’s worth of use. Product Dimensions: 16.3 x 20.8 x 23.5 in. The Char-Broil Big Easy Oil-less Liquid Propane Turkey Fryer (Char-Broil Big Easy) is one of the best outdoor fryers on this list, and is pretty slick. It’s designed to cook food – especially meat – in a safe environment without oil or hazardous liquid spills using infrared air-frying technology. The food cooked in this type of fryer tends to be healthier than regular frying. You don’t use oil with this system, which is pretty cool. The full frying set includes a cooking basket with a handle for easy access and lifting, a base, one propane burner, a thermometer, and a lid. The burner produces a max of 16,000 BTUs, which is on the low side compared to other units on our list but is adequate for this air-frying system. This fryer uses infrared technology, similar to what is commonly found in electric patio heaters. It weighs 29 lbs. and has full product dimensions of 16.3 x 20.8 x 23.5 in. The Char-Broil Big Easy additionally comes with a guide so buyers can set up the fryer and start cooking as soon as the set arrives. The product is black and silver, and the manufacturer offers a one-year warranty against defects. This fryer is so unusual compared to other models that this review made a separate category just for it – Healthiest Fryer. It’s hard to put it in competition with the other products since it doesn’t do a traditional, oil fry and that can be either a pro or con depending on the buyer. However, its low price and ease of use mean it deserves a spot on the list. Even if it is in a strange sideways category and not the traditional list! Those who want to fry their food to a crisp but avoid tons of oil – this product is perfect. 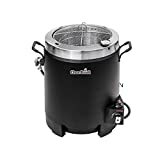 The Chard Outdoor 50,000 BTU 18 Qt Propane Gas Dual Basket Tailgate Party Fun Deep Fryer (Chard Outdoor) is a little different from the other products on this list. It doesn’t have a cover and, instead, users will be frying food in the open air. The fryer comes with a black removable stand for easy setup, cleaning, and transport. The cooking pot that sits on top can hold 18 quarts of oil and comes with two removable fry baskets with insulated handles. This fryer was made primarily for tailgating so sports fans could fry more than one food at once and not worry too much about clean-up. The entire frying set weighs 18 lbs. and stands 21 in. tall. The fryer is insulated to prevent damage from the hot oil and also to keep the oil warm despite the open air design. The Chard Outdoor is powered by unincluded propane tanks. The burners can produce 50,000 BTUs of energy, which is a pretty solid power output. In other words, keep hands out. This is a great, if unusual, product for many outdoor fryers. It’s reasonably priced, can be transported easily, and provides the user with cooking options by having space for two separate baskets. The low price point makes it attractive for those who enjoy tailgating, camping, or outdoor fish fries. The only major downside is the open air design, which can splash hot oil. Chefs should know what they’re doing when working with this one! For all of these reasons, it takes second place since it’s not quite as good as the Bayou Classic but still a solid model, and its a great choice for tailgating. Product Dimensions: 17.5 x 17.2 x 26 in. The Bayou Classic 700-701 4-Gallon Bayou Fryer Stainless Steel (Bayou Classic) is as traditional as an outdoor fryer can get. The fryer looks like a Star Wars imperial walker from the 1970s. It is made up of a stainless steel box with a lid that opens to an oil well, the heating system, and two frying baskets large enough to hold chicken, fish, and other delicious foods. The baskets are easy to remove and the oil can be cleaned out of the Bayou Classic without much difficulty. A temperature gauge is included so users can control the heat needed for cooking. The entire fryer weighs roughly 43 lbs. and comes with an adjustable stand to change the height of the cooking well. The full product dimensions are 17.5 x 17.2 x 26 in. and the well holds roughly 4 gallons of cooking oil. Users can connect a regular propane tank to use as the heat and energy source. One benefit of the Bayou Classic is that it’s designed to keep the oil moving during the cooking process. This prevents the interior from becoming burned or scorched and fries food evenly. The stainless steel is also easy to clean and not susceptible to damage from being outdoors in the elements. This is one of the most well-reviewed and well-liked outdoor fryers for a reason. The design is a combination of simplicity and good engineering. That means food gets an even cook, burning is minimized, and the entire fryer is easy to clean and store. The temperature gauge and gas control are designed well, and the Bayou Classic has one of the lowest rates of manufacturer errors in its construction, and the whole package is covered under a 1-year warranty. If you’re willing to shell out the coin for a high-quality outdoor fryer, the Bayou Classic is definitely for you. It is the best outdoor fryer available. No matter what people want to cook outside, there’s a fryer for it. This review covers five of the most popular models on the market. While the best is the Bayou Classic for sheer craftsmanship, there are also less expensive models like the Chard Outdoor and FDW which provide a good fry for half the price. So, enjoy unhealthy food while enjoying the great outdoors, and choose a fryer that can cook up a turkey or school of fish without worrying about whether or not it will work. And if health is on your mind, you could always go for the more virtuous Char-Broil Big Easy Air Fryer!